196 pages | 30 B/W Illus. A History of Equestrian Drama in the United States documents the history of equestrian drama in the United States and clarifies the multi-faceted significance of the form and of the related stage machinery developed to produce hippodramas. The development of equestrian drama is traced from its origins and influences in the sixteenth century, through the height of the form’s popularity at the turn of the twentieth century. Analysis of the historical significance of the genre within the larger context of U.S. theatre, the elucidation of the importance of the horse to theatre, and an evaluation of the lasting impact on theatre technology are also included. 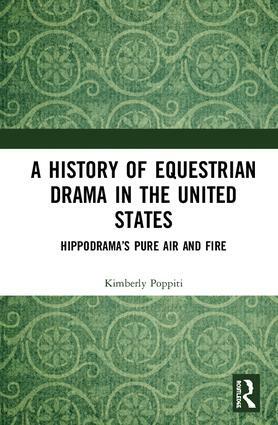 Kimberly Poppiti, PhD, MFA, has been studying and writing about horses and theatre for years. She has published numerous related articles and is a two-time winner of the USITT's Herbert D. Greggs Award (2017 and 2013) for her writing about theatre design and technology. For over 20 years, she was a full-time professor at Dowling College, where she chaired the Department of Communication and Performing Arts. She still works as a professor, and as a writer, living on Long Island with her family.